Pineapple is one of the best fruity flavors for a cake. 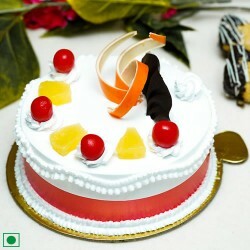 Our company is the best one if you want to send pineapple delight cake Jaipur. They are best for birthday parties and can lighten up the mood. You can easily buy cake online from our official website. Just order cake and you will have cake delivery in no time. You can browse the different designs of the cake online. Our beautiful pineapple flavoured eggless cake will surely delight you. The chefs of Gift Jaipur will prepare the best pineapple delight cake that you will ever taste. The use of fresh ingredients gives our cakes the perfect taste.